Picture this: your students are working diligently on math centers. You have been pulling small groups and students are really starting to “get” the math concepts. Then, it is the end of the week and your students turn in all their math center work. You stare at the huge pile of papers, a bit daunted with the idea of grading all that student work. Can you picture that? That was me during my first couple of years teaching. I loved math centers, but I did not love the daunting task of assessing them. To be honest, I still don’t love it (not even a little bit), but I have learned how to tackle this task and make it a bit more bearable. 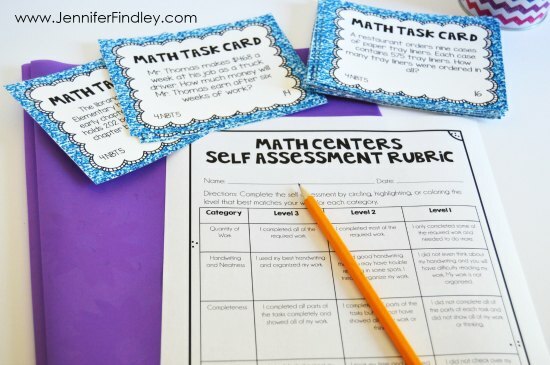 In this post, I am going to share a few tips for assessing math centers that has worked for me over the past few years. Each tip can be used in isolation or in conjunction with the other tips. 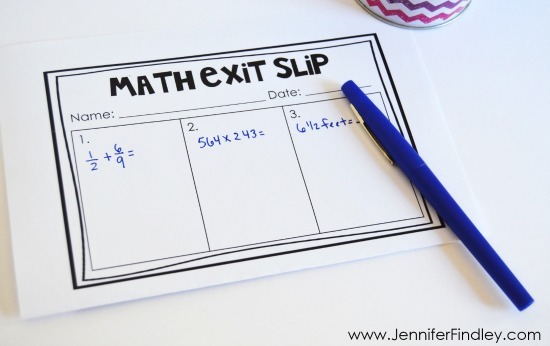 If you would like to purchase some ready-made exit slips to use for 5th grade math, click here to see the ones I have available. 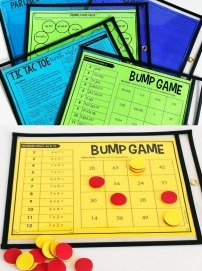 I use these primarily for whole group instruction days, but they would also work perfect to assess math center skills. It typically works out to about 2-3 questions per day that we do centers (I only do centers 2-3x a week). I do still check the center work for completion but this gives me a great look at how my students are doing with the skills. Also, most of my centers are self-checking so taking academic grades on those centers (versus completion grades) is not always an accurate view of how they are performing on the skills. Click the “Download Here” image at the bottom of this post to grab the exit slip templates. Rubrics are a great way to assess math centers. You can use an overall math center rubric or specific rubrics for each or some of the centers. An example of a center that lends itself to using a rubric is a math choice board center. To read more about scoring math choice boards and grab a rubric for free, click here. Here is the overall math center rubric that I use to assess my students’ work. When I do grade my students’ work for accuracy (versus completion), I score my students based on how many of the required problems they solve and then how many of those they got correct. They get points for each center, which adds up to their one math center grade for the week. Click the “Download Here” image at the bottom of the post to grab some rubric templates to use with any math centers. 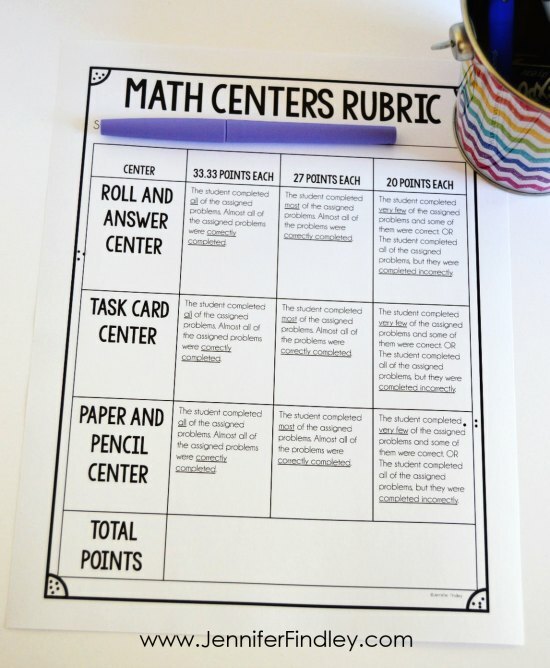 In the download, I included a rubric for three math centers and one for four math centers. I have about 4-5 math centers going on at a time, typically, but I only assess 3-4 of them. To read more about what I usually put in my math centers, click here. Another way to help students assess the quality and quantity of their work is through self evaluations or self-assessments. Students can complete this self-evaluation and then staple it to their center work for the week. This will help hold the students accountable, and while it may not help you get actual grades, it should improve the quality of work you get from centers. You can also grab this self-assessment rubric at the bottom of this post with the other free downloads. The math task cards show in this image are from my 4th grade math task card complete collection which you can find by clicking HERE. The fifth grade set can be found by clicking HERE. And the final option is that you may want to individually grade the work from math centers for accuracy (versus just a completion grade or using a rubric). Choose the centers that you will grade. I don’t typically grade partner centers. I check it for completion only. For each center (or as many as you can) assign “must-do tasks or problems” for the students to complete first. Ensure the students clearly number those tasks and then only grade those tasks/problems. This will keep you from having to grade a bunch of different problems. You will only need to grade the must-do problems regardless of how many problems the students complete. Use recording sheets or explicitly teach the students how to set up and organize work on a piece of paper. This will make grading so much easier and less frustrating for you. 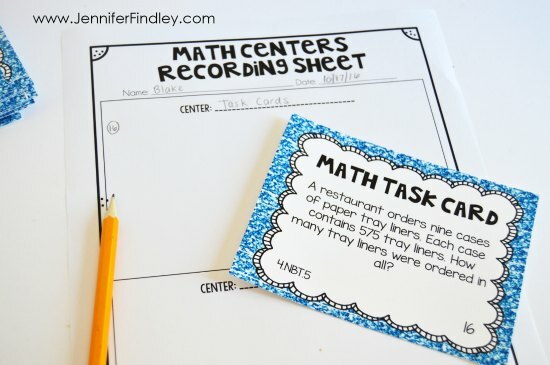 I actually use one consolidated recording sheet for all of my math centers. We record the math work from two centers on the front and two on the back. My students know to use a scratch piece of paper if they need more room. At the end of the week, the students staple their recording sheets, any scratch papers used, and their self-assessments (mentioned above) and turn all their work in. You can grab this recording sheet to consolidate your recording sheets at the link at the bottom of this post. 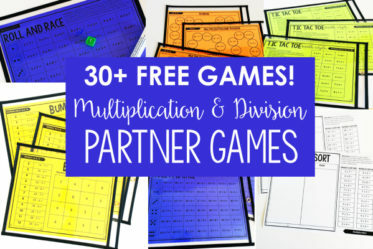 If you need math centers that come with recording sheets and answer keys, check out my grade level bundles linked below. 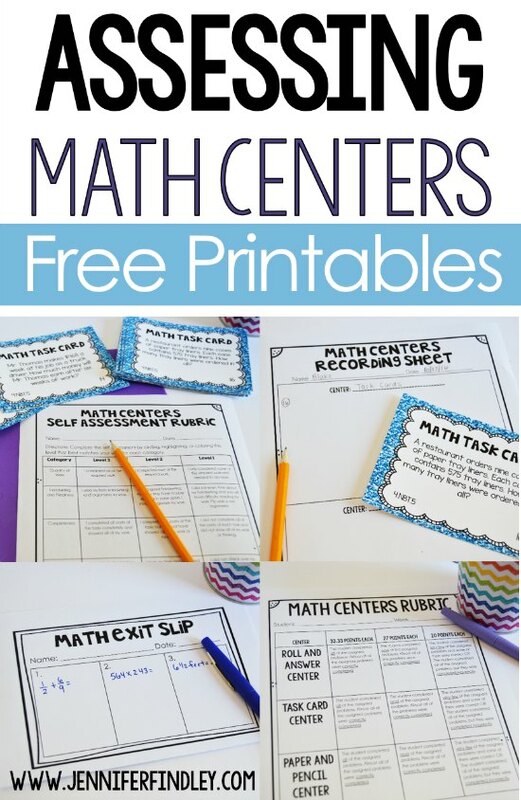 These huge math center bundles include everything you need to get started with math centers. 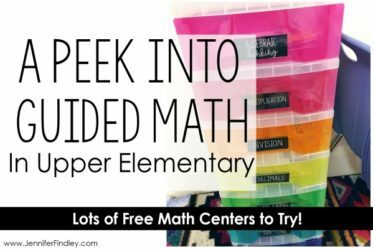 The bundles include math centers for each and every standard for the specific grade level, and many of the standards include more than one center. Remember that huge pile of student work I mentioned in the beginning of this post? Well, I still have quite the stack because my students do a lot of work in their centers, but it is much more manageable now. Using these ideas and printables I shared makes my grading so much easier and more purposeful. To download all those goodies for yourself (the exit slip templates, the math center rubric, the self-evaluation rubric, and the recording sheet) click on the image below. Do you do any of these tips already? 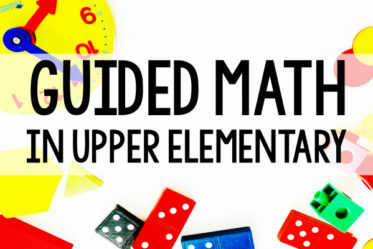 Do you have other tips to share to help when assessing math centers? Let me know in the comments! Thank you so much for this! It was like you were in my classroom reading my mind! i have started student-led weekly stations and by Friday, i have 4 papers for each student. Sadly, I am throwing away so much paper. This was so helpful! The freebies were amazing. I have learned so much from you and your blog! Asti, I am so glad these will help you! Thanks for stopping by! I taught 3rd grade for 3 years, and this year I’m teaching 5th grade math. I have been binge reading all of your math posts this summer, and I feel SO much more confident in this next year! You’re a true God-send. Thank you!!!! Thank you so much for this! I am a first year teacher (5th grade math), and I have been running around trying to get my classroom in order. Just when I thought I was almost done, I remembered that I need a way of collecting data during math centers. You are amazing!! Thank you so much for all of your wonderful ideas and support!